If you’re in Siena soon, take an hour or two to enjoy the large museum complex of Santa Maria della Scala, right across from Siena’a cathedral. 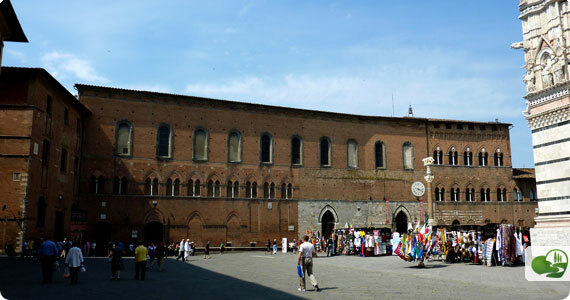 The museum is large and offers 7 permanent itineraries through the ancient hospital. Read more about the entire museum complex here. 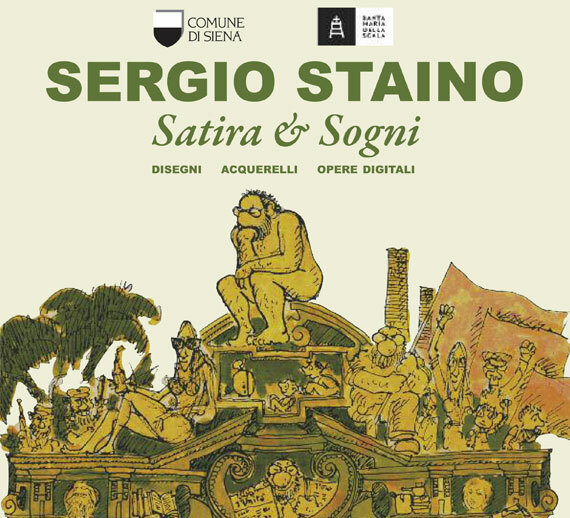 Right now and up to November 3, 2014, if you visit the complex you’ll also get a chance to study and admire the temporary exhibition dedicated to Sergio Staino, the first personal anthology dedicated to the nationally known artist, called “Sergio Staino: Between Satire and Dreams”. Known as one of the most important satirists in Italy today, the exhibit brings together over 300 works that go from his first cartoon strips of Bobo for Linus from the early 1960s to the more recent works created entirely in digital form and published in national newspapers. Since 2000, the artist was forced to abandon his traditional drawing tools of pencils and pens as problems with his sight worsened. Since then, he has learnt and mastered new techniques of drawing by hand on a touchscreen, and today comments that while “it was a sad passage, in reality he discovered a marvelous part of the world” with the opportunities to meet, compare and change he had with his work. The larger part of the exhibition is thus dedicated to this digital area where only a few artists have started exploring. To learn more about the exhibition, go to www.sergiostaino.it and to learn more about the Santa Maria della Scala complex here.